, you can now subscribe to RGV Life on your Kindle. One of the benefits of the Kindle is that it allows you to read material anywhere you go without being tied to a computer. This gives you the ability to focus on the material without the distractions of email or other communications popping up to break your concentration. We are excited to be a part of the Kindle blog listings. This allows us to reach our audience in more ways. There are many more exciting things coming up for RGV Life. Keep checking back. 305 (B) N. Shary Rd. The Mission FFA senior parliamentary procedure team earned themselves a first place finish recently at the regional leadership development events. This qualifies them to participate in the state competition to be held at Sam Houston State University in Huntsville, TX in early December. The senior team consists of: Dulce Alvarez, president; Alejandra Reta, vice president; Jennifer Quintero, secretary; Renata Bazan, treasurer; Christian Quintero, reporter; Miguel Ceron, sentinel; Ashley Guerrero, advisor. The freshmen parliamentary procedure team also competed at the regional event and finished in third place. However, they will not be advancing in competitions. They are: Vanessa Calderon, president; Abraham Weaver, vice president; Emily Guzman, secretary; Jacob Solis, treasurer; Alvaro Gonzalez, reporter; Jahaira Cardoza, sentinel; Briana Alonso, advisor. We at RGV Life wish you a happy Thanksgiving Day. May you spend some time amongst your closest friends and family. Spend some time remembering those things for which you are grateful in your life. We have a lot going on, preparing for the holiday weekend, ribbon cuttings, ground breaking ceremonies, Christmas Parade and Business After Hour Mixers. We hope these e-blasts help to remind us all of everthing we have to be thankful for in our lives! Mission CISD (Consolidated Independent School District) officials are asking parents to be patient this afternoon as they work to get children home after school. The district's transportation department has been overwhelmed, leaving the district short on buses to use for taking students home at the end of the school day. Twenty of the district's 72 available buses are being used for a larger than usual number of UIL events. While today's bus shortage is expected to impact the junior highs and high schools the most, a number of elementary school routes will likely be impacted as well. District officials say delays could be as much as an hour. District officials said attempts were made to use charter buses for some of the UIL events, which would have lessened the problem. However, no charter buses in the area were available. District officials are making attempts to get word out to as many parents of children who ride the bus as possible. The Pharr Chamber of Commerce is seeking a Membership Director. The desired candidate must be able to take initiative and demonstrate strong leadership skills, possess excellent communication skills, be able to manage people and committees, plan and host events, but most importantly SELL, SELL, SELL Chamber Memberships by recruiting new businesses to the Chamber. Chamber experience is a must, along with a degree in marketing, business or communication. If you're sure you have what it takes, please forward your resume to lbazan@pharrchamber.com. The Pharr Chamber of Commerce is an equal opportunity employer. Daniel Chavez Is Running As A Republican! McAllen Tea Party cannot endorse any candidates, but will put out information about candidates and their campaigns. Here is an update for the kick-off campaign of Daniel Chavez, who is running against Henry Cuellar for District 28 Congressman. The Holiday Inn where the kick-off will be held is on Shary Road south of Exp. 83. See below for more information. The face of politics has changed. The Health Bill has passed in the House. In the darkness of night, Democratic representatives passed the largest and most expensive legislation that will impact every segment of our life, liberty and freedom. After months of contacting our representatives, countless meetings and protests, and poll after poll indicating the American sentiment against this bill, the Democratic members of Congress opted not to listen. No longer do we, as Americans, have a symbiotic relationship with this party. For that reason, my conscience will not allow me to carry the weight of representing you under the Democratic banner that refuses to listen to the voters and condones voting on a bill in the middle of the night; a bill of such significance and consequence that it will severely affect all our lives. Armed with the purpose to serve, this week I will file my candidacy with the Federal Elections Committee as a Republican Candidate for the 28th Congressional District of Texas, and in December will file for a place on the ballot in the 2010 election. In the coming months, I will keep constituents up-to-date on the actions taken by our current representative so that we, as voters may hold him accountable. Together, we will restore America's liberties, rebuild the trust lost by the House of Representatives, and regain the fiscal responsibility of our country. With your help, we can reclaim our political representation; one which truly represents 'We the people.' This is your voice being heard - your choice for the future. May God Bless each of you and this great nation. Our campaign officially gets started on Tuesday, November 24th at 6 pm. All are welcome to attend. We'll be at the Holiday Inn on at 901 S. Shary Road, one block south of Highway 83! You may park anywhere close to the main building upon entering the front gate. Join us for your monthly networking and marketing session and enjoy a hearty meal before your Thanksgiving break! The Raquel Cavazos Elementary School Parental Involvement is holding a Tamalada-Tamale making class on Saturday, December 5. The cost is $20 for a single person(take home 2 dozen tamales) or $30 for a couple(take home 3 dozen tamales). The school will provide all the ingredients. Participants will have to bring some of the cooking utensils. Registration for the classes closes Monday, November 30th. For more information or to register call Rosie Olivares or Letty Ramirez at 323-7200. Raquel Cavazos Elementary School is located within Mission CISD at 803 Los Ebanos Rd, Alton. Featuring Fresh Farm to Market produce, Arts & Crafts, great food and entertainment!! Every Thursday from 8:00 a.m. - 2:00 p.m. Contact us and see how you can be part of Dia de Mercado! Tiene su propia empresa? Desea obtener una Visa de Comercio para establecer o expandir su negocio en los EE.UU.? Este taller, presentado por Foster y Quan, LLP.- una corporacion juridica de nivel nacional - le informara sobre los requisitos para obtener los siguientes documentos. Find out the latest in what's happening at McAllen Tea Party. Yes, it's true... we're undergoing some BIG CHANGES, and you can be an important part. Time for committees! Time for your input, ideas, and enthusiasm! Time to win in 2010 Elections! Come on and be a part, ya'll!!! Tomorrow I'll be a part of the Mission Consolidated Independent School District's annual Principal for a Day. I'll be shadowing a school principal for an entire day to gain some insight into what principals do in an average day. Because this is a school, I can't do the normal thing for me, which is to record video about the experience. I think there may be a moment or two where I may be able to record video where no children are present; but, we shall have to wait and see. I'll be back here on the blog to write about the experience and what I have learned. Before going through it, however, I want to write down some of my preconceptions based on my own memories of the principals I've known over the years. Aftwerwards, I'll compare the list against what I witness. Principals are administrators: For the most part, principals act very much like store managers. They are responsible for reporting and making sure that all required documentation gets done and turned in. Principals are shepherds: Like shepherds, the principal has to be out amongst the students and teachers to help get everybody rounded up and in their pens on time. Principals are team leaders: They have to have a game plan that they communicate to the staff. Then, they have to keep everybody motivated and on task to make sure they carry out the plan. Principals acquire what teachers need: It is the principal's job to make sure that his staff has all the resources they need to carry out their job. Principals are enforcers: Sometimes they have to be the bad guy to make sure everybody stays in line. Principals are the public face of the campus: Just like the President, the Pope, a university president, or a CEO, the principal represents his/her campus. Those are a few of my initial thoughts before actually experiencing the event. I may have a different view of principals due to my own experience growing up. As a small child, the principal is the authority of the school. He's like the Wizard of Oz. Only a few people talk to him; if he talks to you, it's a major event. In later years, the principal was the person to beware, especially when up to no good. Towards the end of my school experience, I realized that the principal was an ally. So long as I acted responsibly, I could get away with murder on campus. Going in, I already have a favorable opinion of the principal's job. Most of this is due to brief interactions with them at various points. I do not expect this will change, except that I'll have a much more firm basis for forming my opinions. I will let you know what happens. Gah - by the looks of it, there are A LOT of Campaign events this week. I am attaching an invitation with info on all the events scheduled for this week. 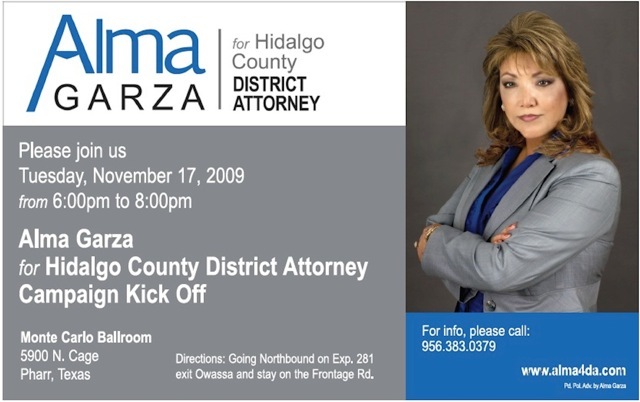 Tuesday is a Campaign Kick Off for Alma Garza for District Attorney. Wednesday is a Campaign Fiesta for Arturo Guajardo for County Clerk. Thursday is a Campaign Kick Off for Veronica Gonzales for State Representative. Saturday is a Golf Tournament Fundraiser for Justice Linda Yanez for 13th Court of Appeals. 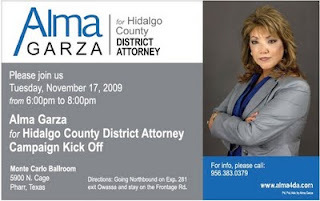 Saturday also is a Campaign Kickoff/GOTV Bicycle Tour for Dolly Elizondo for Hidalgo County Democratic Chair. 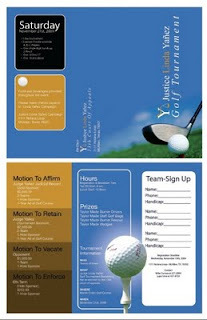 Their invitations and additional info on each event are attached chronologically below. Finally, at the very bottom of this email, as some inspiration/motivation to get involved, support our Democratic Candidates and Help Turn Texas Blue, is a letter from the Texas Democratic Party regarding: Democratic State Reps Targeted by GOP Extremists. Hope to see you at some of these events. Mark your calendars, dust off your bikes, and get ready for a FUN bike ride. Sign up early and get a FREE t-shirt! Just download the registration form send it in with your check then pick up your packet the day before the race, and LET's Go! Ride to G.O.T.V. 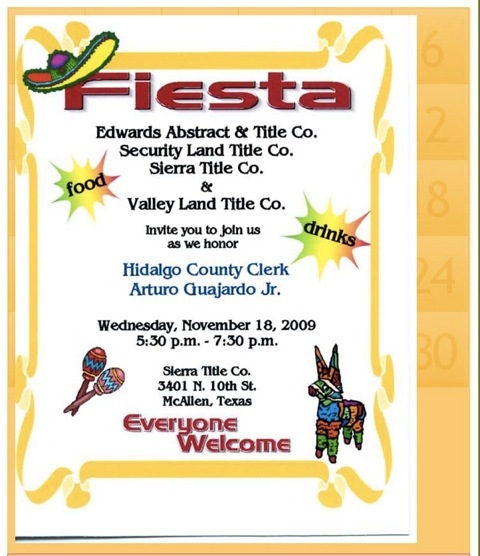 is a re-election FUNdraiser for me, Dolly L. Elizondo, Hidalgo County Democratic Party Chair. Besides being a mom, business owner, and Party Chair….. I love to cycle. In 2006 I purchased my 1st race bike and convinced my best friend Velma Garcia to do the same. We both had a fall the same year and I stopped cycling. With Velma's encouragement, in early 2009 I began cycling again and love the sport. By participating in this event you will help me continue to serve our community as Democratic Party Chair, an elected position in which I receive no monetary compensation and is 100% volunteer driven. You will also become part of history!! I intend to put on this ride every year converting it into a non-profit bipartisan event. Funds will go to VOTER REGISTRATION PROJECTS in HIDALGO COUNTY in the future.